Turning serious, Eaton said that there was something odd about speaking to undergraduates about leadership because she felt closer to their age than hers (64). Eaton cited three women who have shaped her life: her mother, her daughter Katherine, and actress (and fellow Vassar College alumna) Meryl Streep. Her final tip was perhaps her most important, she said. 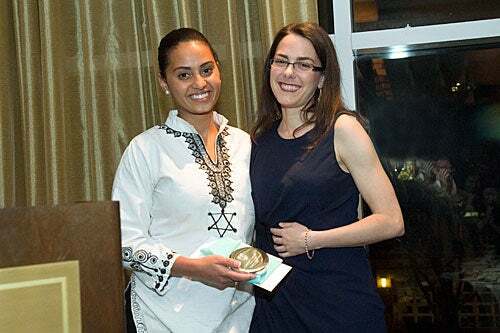 Senior Naseemah Mohamed, the recipient of the undergraduate Women’s Leadership Award, poses alongside Gina Helfrich, director of the Harvard College Women’s Center, which sponsored the event. Senior Mohamed, the recipient of the undergraduate Women’s Leadership Award, boasts a dizzying array of accomplishments, including: president of Harvard African Students Association; co-director of the Pan-African Dance and Music Ensemble; chair of the African Union of the Harvard Model Congress; and author of articles and book reviews. Perhaps most remarkably, Mohamed created a successful arts-based literacy program for an impoverished high school in her hometown of Bulawayo, Zimbabwe. She said that she was humbled not only to be in the company of a group of women who “are already changing the world,” but also to think of those who made it possible for her to change her life: the teacher who encouraged her to apply to an international debate exchange program in the United States; the host family that offered to pay for her prep school education; faculty mentors at Harvard who guided her studies. Their examples, Mohamed said, taught her that leadership should be about empowering and uplifting others. Mohamed went on to say that, although she was honored to receive the undergraduate award, she believed that leadership was a journey, and that she has a long way to go. Harvard College Dean Evelynn M. Hammonds opened the celebration with thanks to the staff of Harvard’s Women’s Center for organizing the event, and with words of praise for Mohamed. Hammonds called Eaton “a vanguard of the arts,” and thanked her for her work and presence at the awards. Terrie Fried Bloom ’75, M.B.A. ’81, whose gift established the awards in 1997, also attended the dinner on Thursday night. She expressed enthusiasm for this year’s honorees, who joined past recipients astronaut Stephanie Wilson ’88, University of Chicago President Emerita Hanna Holborn Gray, and Tina Tchen ’78, chief of staff to first lady Michelle Obama. Richard A. Meserve, J.D. 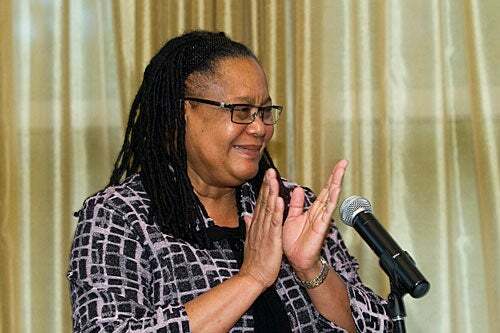 ’75, has been elected president of the Harvard Board of Overseers and Lucy Fisher ’71 will be the vice chair of the Board of Overseers' executive committee.